Low-profile tilt mount holds most TVs from 22" to 46" (up to 66 lb.). 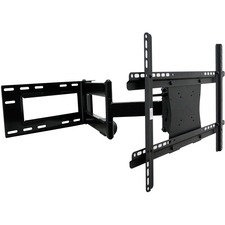 Sturdy, easy-to-install mount features double-stud mounting for greater strength and security to mount your TV less than 1-4/5" from the wall for a sleek look. Mount tilts from positive 5 degrees to negative 15 degrees to give you the ideal viewing angle. Medium Tilt Mount may also be used with brick/concrete walls and other wall types. TV interface arms hook onto wall bracket for easy installation with the included mounting hardware. Universal design fits all VESA and non-VESA mounting patterns up to 400 x 400mm. Mount is made of steel with plastic accessories. 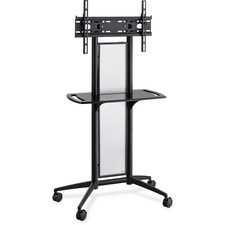 Flat panel TV cart lets you move your monitor smoothly throughout your work space. Cart holds a monitor up to 42". Roll easily on four casters (two locking). Cart includes a steel frame with a powder-coat finish and translucent polycarbonate panel. Weight capacity is 80 lb. Shelf holds 5 lb. Wide audio/visual cart holds heavy monitors up to 27" on the top shelf and offers space for other devices and supplies on the two other shelves. Legs form wide base to help distribute weight evenly. Top shelf holds up to 50 lb. Middle shelf holds up to 40 lb. Bottom shelf holds up 40 lb. All-steel cart also includes UL approved three-outlet electrical assembly, four swivel casters (two locking) and a safety belt with ratchet. 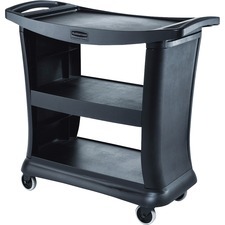 Quartet® Duracart™ - 100 lb Load Capacity - 3 x Shelf(ves) - 42" Height x 24" Width x 18" Depth - Floor - Black Durable, adjustable 3-shelf all-purpose AV cart is guaranteed against stains, scratches, dents and rust. For general office use as a machine or coffee stand. UL-approved 3-outlet electrical strip with 15' cord adds portability. 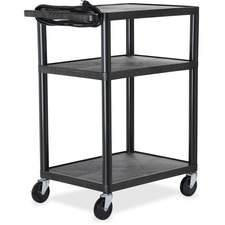 Executive Service Cart offers high productivity, durable construction and pleasing esthetic. Top shelf, with 20 percent more capacity than standard carts, accommodates two business boxes. Cart offers a 300 lb. total weight load capacity with 100 lb. per shelf. Sleek, contemporary styling is ideal for front or back of house applications with wraparound end panels and solid base bumper. Smooth surface is easier to clean and maintain. All-plastic construction has an easy snap-and-lock assembly. Assemble easily with a soft mallet. 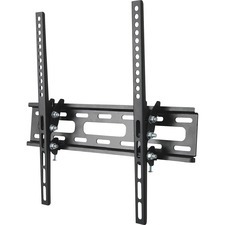 Double-articulated mount fits most 37" to 61" screens (up to 150 lb.). Low-profile design folds flat to wall to save space, yet offers a maximum 28-3/10" arm extension to allow mounting anywhere, even in or near corners. Large Full-motion Mount offers a tilt angle of negative 15 degrees to positive 5 degrees so you can create the perfect nonglare viewing angle. Mount swivels 180 degrees at wall bracket, center pivot and screen. Mount will fit all VESA mounting patterns from 100 x 100mm to 600 x 400mm and offers integrated cable management. Completely assembled mount offers fast and easy installation. Mount is made of steel with plastic accessories. 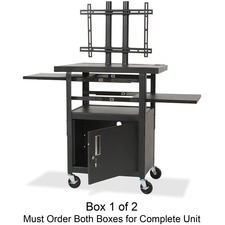 Height-adjustable, Flat Panel TV Cart with cabinet is sold in two parts for a complete unit. This part includes two pullout shelves and LCD/Plasma mounting system. The other part, BLT27530, includes a cabinet top and bottom, assembly hardware and casters. Twin-post mounting bracket provides flexibility and stability for a display height of 46" to 62". 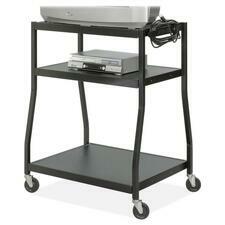 Cart accommodates up to a 32" flat panel TV. Mounting bracket posts are 20" high and have built-in wire and cable conduits. Height adjustment on each post will allow four separate adjustments in 1" increments. Two hideaway shelves for a laptop or multimedia projector are stored under the top. Secure your components in the spacious 24" wide x 18" deep x 15" high locking storage area. Cart includes 4" swivel casters (two locking) for mobility and UL/CSA approved, four-outlet, surge protector, electrical assembly with 25' cord and cord winder. Cart weighs 85 lb. Height-adjustable, Flat Panel TV Cart with cabinet is sold in two parts for a complete unit. This part includes a cabinet top and bottom, assembly hardware and casters. The other part, BLT27532, includes two pullout shelves and LCD/Plasma mounting system. Twin-post mounting bracket provides flexibility and stability for a display height of 46" to 62". Cart accommodates up to a 32" flat panel TV. Mounting bracket posts are 20" high and have built-in wire and cable conduits. Height adjustment on each post will allow four separate adjustments in 1" increments. Two hideaway shelves for a laptop or multimedia projector are stored under the top. Secure your components in the spacious 24" wide x 18" deep x 15" high locking storage area. Cart includes 4" swivel casters (two locking) for mobility and UL/CSA approved, four-outlet, surge protector, electrical assembly with 25' cord and cord winder. Cart weighs 85 lb. 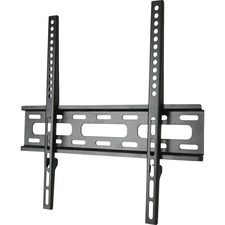 Low-profile mount holds most TVs from 22" to 46" (up to 66 lb.). Sturdy, easy-to-install mount features double-stud mounting and provides greater strength and security yet mounts your TV less than 1" from the wall for a slim sleek look. Medium low-profile mount may also be used with brick/concrete walls and other wall types. TV interface arms hook onto wall bracket for easy installation with the included mounting hardware. Universal design fits all VESA and non-VESA mounting patterns up to 400 x 400mm. Mount is made of steel with plastic accessories.